TALLINN, ESTONIA / ACCESSWIRE / June 21, 2018 / There has not been an invention since the creation of the internet that has struck a chord with the modern way of life and has created as much buzz as the blockchain and cryptocurrency universe. Since the advent of Bitcoin, the creation, transfer and distribution of value no longer solely rests at the doors of governments and their central banks. As anyone from any part of the world is able to conduct fast, secure transactions with another peer without the need for any middleman or payment gateway for the first time in history. However, despite the huge strides the crypto world has made since the just under 10 years of its existence, this is an industry that remains severely challenged from all sides, as existing business sectors such as the world banks have ganged up trying to derail its achievements. From the banning of the use of their credit cards to blacklisting accounts owned by crypto businesses, the banking industry has been extremely antagonistic to the rise of cryptocurrencies. Which means the industry will starve if financial services that will aid to claim its rightful place in our brave new world. MyCryptoBank, as the name implies, is an all-new highly innovative banking platform that is built specifically to tend to the needs of the crypto industry, ridding it of the myriad of problems it faces from the traditional banking sector. MyCryptoBank is a carefully built online banking establishment that was tailor-made with effective tools that crypto enthusiasts and businesses all around the world can rely upon as they go about their daily endeavors. MyCryptoBank hopes to become the all-convenience, one-stop shop where all crypto lovers and investors can safely trade, move assets, and spend using cutting-edge banking tools that have been denied them by the present industry. Crypto ATMs: Among the very unique assets that MyCryptoBank already has to offer its users are one of kind crypto-enabled ATMS. These automated teller machines have been carefully designed to specifically tend to the needs of crypto owners and serve as the convenient tool for them to either withdraw their money using their existing cards or use cash in order to buy cryptocurrencies at an instant. Buying cryptocurrencies can still be a nightmare for a lot of people in a lot of regions of the world. MyCryptoBank will use its revolutionary crypto ATMs to change the game and make them as accessible as fiat currency. Crypto Exchange: While the use of cryptocurrencies is growing with every passing day, the need for exchanges to find the right crypto asset for the right services is very essential for users all around the world. This is why MyCryptoBank has its own on-platform crypto exchange to serve as a one-stop shop for users to access and buy the cryptocurrency of their choice without hassle. Forex Terminal: As a bank of a unique form, MyCryptoBank completes its arsenal of tools with a unique, fully liquid Forex terminal that completes the circle and makes the platform uniquely positioned to tend to both the fiat and crypto needs of its users using only one account. 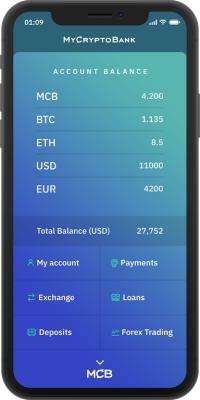 These are not all the products that MyCryptoBank plans to launch after the project is launched, customers will also be available through terminals accepting cryptocurrency, loans secured by cryptocurrency, bank transfers and other services so necessary for the crypto industry. With two cryptocurrency licenses already under its belt and a number of cool features like its super-convenient MCB payment rings and the powerful Multi-Digital Cards, MyCryptoBank is taking the game to an all-new level as it blurs out the stark divide and offers crypto users all around the world that banking convenience they've been looking for.